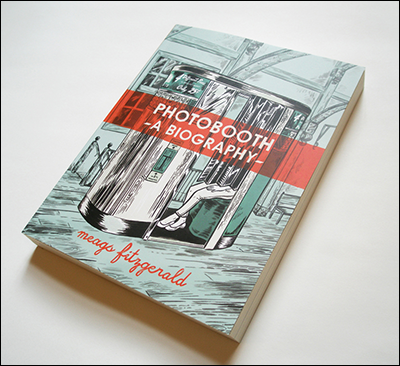 Illustrator and Art Director Meags Fitzgerald’s output in drawing and publishing is tremendous, including the nonfiction graphic novel “Photobooth: A Biography” and a fantastic series showcasing her ambidrawing talents. 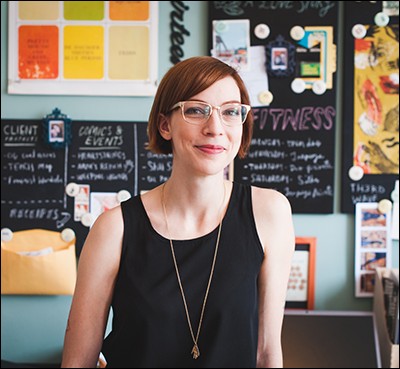 Here, she tells more about carving her creative work lifestyle—her way. who makes her art her life’s work? It wasn’t until my first graphic novel was released (below) that I could detect that people’s attitudes towards me had changed, and though I was never after their approval, everything does become easier when you don’t believe there is resistance all around you. I’ve been self-employed for eight years now, it gets easier every year in that I don’t have to hustle for work like I did, but more difficult too in that there’s more expected of me, the jobs are for higher-profile clients, and I have to continually find ways to keep myself feeling challenged and excited by what I’m doing. What methods/activities did you activate to help you actually start working and living your passion? Because “Just do it” is easier said than done. I left my house and met real people. It seems like a silly thing to say, but these days, I think we expect everything to take place online—we forget the value of in-person connections. I would never have got my first chances, if it weren’t for friends and acquaintances thinking to hire me for some small poster or t-shirt gig. All my early jobs were based on being a present member of my community (like attending tons of comedy, theatre and music shows), and therefore, being at the front of people’s brains when opportunities came up. I’ve had very little success with ‘cold-calling’ art directors by sending them a link to my portfolio. It’s true when they say “it’s all about who you know.” I think a lot of artists coming straight out of school think that your portfolio is the only thing that matters, but clients and art directors can choose to work or not work with you for a multitude of reasons. It’s important to let your personality shine through! With “Art is long, life is short” in mind, how do you keep yourself to task in productively honing your craft and getting things done? My greatest struggle is balancing my time between the client work that pays my bills and the work I’m doing for myself. My own projects will ultimately do a lot more for my career than the client projects, but the pay-off for them can be years down the road. It’s so hard to prioritize my own work when a fun, paid project is waiting right there to be worked on. I hope to always be advancing my skills, if I wasn’t, I think I’d lose interest in illustration work pretty quickly. One trick I have is to set a personal challenge for every client project. Whether it be a technique I’m rusty at or taking an unconventional approach to the composition, I want to take all the opportunities I can to keep improving. Firstly, I try to pat myself on the back every once in a while. It’s so easy to take a rejection letter too much to heart or scrutinize your own work and compare it to the work of artists who’ve been at it for ten years longer than you. If you’re attempting to be a self-employed creative professional, you’re in a perpetual state of risk-taking and that ain’t easy. I heard something once, (I don’t think it’s an attributed quote, just a nugget of wisdom) that goes “I’m willing to risk the usual so I don’t have to settle for the ordinary.” I’ve always known that I didn’t want an ordinary life so that notion helps drive me. I believe I’m worth investing in and that my career/life is worth taking some risks for. Inevitably that path will be bumpy and uncomfortable at times, but that’s when you summon all your grit and remind yourself why you’re doing this. as it relates to your livelihood? I’m pretty fortunate right now in that I can be selective about the projects I can engage. I choose to only work on things that really interest me or are for cool clients whom I have shared values with. Professionally speaking, I’d like to do more art direction and eventually phase out most of my illustration work. Personally, I’d like to own either my home or studio space. 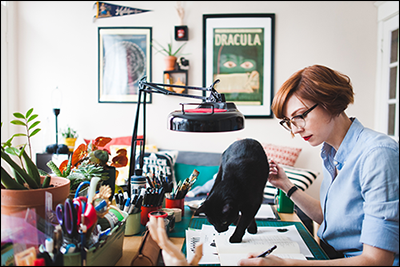 As both an artist and as a single woman, it can be so difficult to buy your first place. I’ve always wanted a space that was really all my own, and I think it would feel like an amazing accomplishment to pay for it with a career I built from scratch. What is the one tool that helps make your work more accomplished and pleasant, as a result, making your life good? 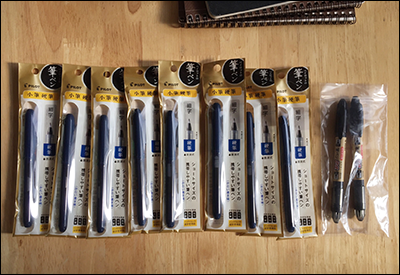 These Pilot Japanese brush pens are my secret weapon. They’re so helpful when I’m on the road or need to knock out an illustration really quickly. I buy them in bulk from Japan about twice a year! All images, including photography by Alex Tran, courtesy of Meags Fitzgerald. 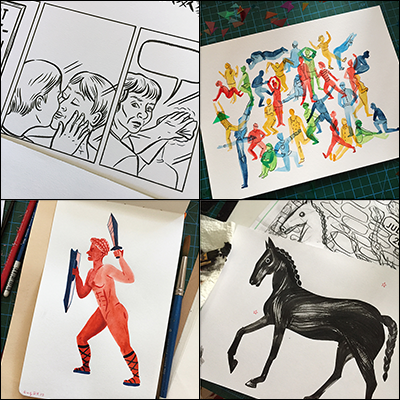 Check out Meags Fitzgerald on Patreon to support her work.